At some point, most investors decide to move their assets from their employee-sponsored defined contribution 401(k) plan into a rollover or contributory IRA. The decision is one that requires a great deal of forethought; investors need to decide where they are going to roll over those assets and who is going to administer the new fund. Spectrem’s new study The Million Dollar Rollover Opportunity asks investors how they decided to roll over their 401(k) funds and what they decided to do with the amount. Spectrem also surveyed investors who are going to be making these same decisions in the coming couple of years to see how they are approaching the subject. The Million Dollar Rollover Opportunity represents responses from two groups of investors: those with at least $1 million in net worth who have rolled over at least $800,000 from a DC plan into an IRA or another plan within the last two years, and those with at least $1 million in net worth who intend to rollover the same amount within the next two years. For investors with a sizable employer-sponsored defined contribution account, those funds represent a huge part of their financial future. According to the report, 64 percent of investors with a sizable rollover amount consider those assets to represent about half of their total assets. Twenty-two percent consider those assets to be the largest portion of their retirement account assets. The decision to rollover a six or seven-figure sum from a 401(k) to an IRA requires a great deal of thought, and most investors seek assistance in making those types of decisions. 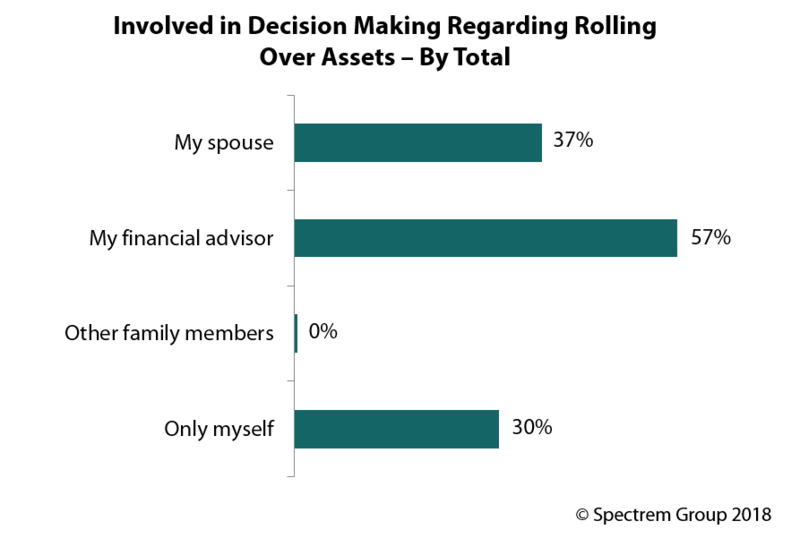 Of those investors who have already rolled over their DC assets, 57 percent consulted with their financial advisor, 37 percent discussed the decision with their spouse, and 30 percent made the decision on their own. Notably, 19 percent of the Millionaires in the study do not use an advisor, so that means 11 percent of those with an advisor chose not to consult their advisor on the topic. This is meaningful data to advisors who work with investors who still have 401(k) accounts. An investor would likely benefit from the advice of a professional advisor in making the proper decision, even if the ultimate decision does not benefit the advisor. However, providing timely and meaningful advice could probably give an investor a reason to lean toward keeping that advisor going forwards. But not all Millionaire rollover investors maintain their advisor relationship when they forward the assets into a new account. Fifty-five percent of Millionaire rollover investors moved the assets into an IRA managed by their existing financial advisor, which is the good news. The bad news is that 9 percent of Millionaire rollover investors find a new client to handle the process and accounts, and 23 percent rolled their assets into a brokerage account which the investor directs. Also, 25 percent rolled the assets into an IRA asset they already own. Advisors can start the conversation about rolling over assets from a 401(k) at any time in an investor’s life. According to The Million Dollar Rollover Opportunity, 34 percent of Millionaires who have already rolled the assets into an IRA spent several years discussing the plan with a financial advisor before pulling the trigger on the transfer. Twenty-nine percent said they spent two or three years on the topic, while 13 percent gave the decision very little forethought. Spectrem research shows that IRA ownership is very popular among wealthy investors. But the transfer of funds from an employee-sponsored account into an IRA is a decision not to be taken lightly. As with many other topics, this decision often requires the advisor to bring it up first. There is nothing offensive about an advisor discussing retirement asset transfers with an investor, and the investor might find out that their initial timing plan is not the best idea for them.